Would the Furious 7 Skyscraper Jump Really be Possible? If you are one of the millions of people who has been to see Furious 7 in theaters since its release, you know that the movie–much like the rest of the franchise–is packed full of outrageous stunts and high speed chases. There is one stunt that sticks in the memory perhaps more than the rest. In one scene, the crew finds itself in Abu Dhabi, trying to steal a rare Lyken Hypersport car from the top of a skyscraper. As they attempt to get away, Vin Diesel’s character drives the car out of the window and into another skyscraper. 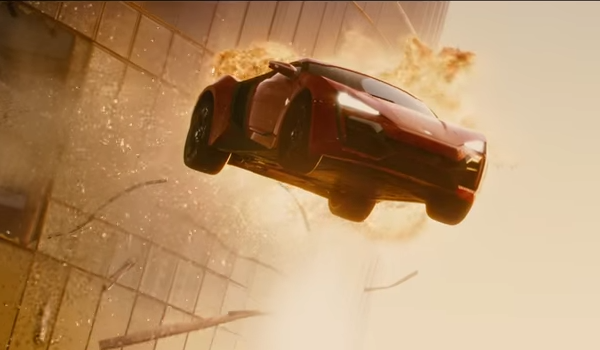 He then continues–after realizing that the car does not have working brakes–into another skyscraper, where he and Paul Walker’s character are able to bail before the car crashes to the ground. The stunt seems incredibly outlandish, but would it actually be possible? This question was put to a physicist by Vulture.com, and he gave a surprising answer. According to Professor Lee Loveridge, it is “probably the most plausible stunt in the movie.” Who’d have thought? To learn more about the physics behind the stunt, head over to this article from Vulture.com.